So I had thought about adding some dried fruit such as plums to the scones but decided against it because sometimes a simpler flavor is better. 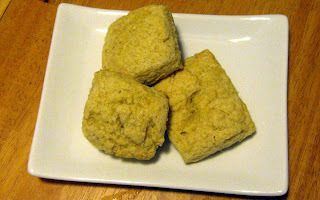 One of my favorite things about these scones was easily the vanilla beans. They add such a beautiful aesthetic appearance and nice flavor. I have a vanilla bean paste in the jar that I use instead of buying vanilla beans. The paste can be found at most gourmet food stores. I only use it when it will make a dessert special and be the spotlight such as these scones or a vanilla bean ice cream. 1. Preheat the oven to 425 degrees. In a large mixing bowl, mix together the flour, baking powder, salt, and sugar. 2. Cut the butter into tablespoon-sized pieces and incorporate it into the dry ingredients. 3. In another large bowl, whisk together the eggs, milk, half and half, vanilla extract, and vanilla bean. 4. Whisk the dry ingredients into the wet ingredients. Turn the dough out on to a floured surface and knead to combine. 5. Pat the dough into a rectangle about ¾”-1” thick. Cut into 12 equal pieces. Pull the wedges apart just a bit and then brush with the milk and vanilla extract mixture. Sprinkle with the granulated sugar. 6. Place the pan of scones in the freezer, uncovered, for about 30 minutes. Then, remove the scones from the freezer and put them right in the oven. Bake for 15-20 minutes or until golden brown. When the scones are done, remove them to a wire rack to cool.